Distinctive landscape of linear strip fields running downhill from the scattered farms lying just below the moorland edge. The area largely falls along the southern edge of the medieval ecclesiastical parish of Llangynhafal. The earliest evidence of activity in the area is represented by the cropmark of a probable Bronze Age round barrow near Tyn-y-coed farm. The land slopes from the moorland edge on the east, at a height of about 215m above OD, down to about 65m above OD, just above the valley floor on the west, the eastern side of the area forming part of the Clwydian Range AONB. The earliest surviving building is Esgairlygain house, a timber-framed house of late 16th/early 17th-century date, set in the midst of fields. Settlement is otherwise characterised by relatively small early 19th-century rendered stone and brick farmhouses along the public road between Llangynhafal to Hirwaun road and 18th and 19th-century or earlier farmhouses just below the moorland edge and approached by long tracks, such as Tyn-y-celyn and Bryn Tirion. Wern-fawr is a large rendered farmhouse and stone outbuildings with slate roofs. Bryn-bedw is similarly rendered, with brick and stone outbuildings. A possibly 17th-century barn at Plâs Draw is of timber-frame construction infilled with brick and with brick ends, together with a stone barn, the house itself being an early to mid 18th-century hall with ?early 19th-century stucco. There are former milk-stands at the entrances to some of the farms. The field pattern is laid out in distinctive parallel sinous strips, generally between about 25-150m across, laid out at right-angles to the contours of the hill, particularly on the lower-lying ground, some of which have now been amalgamated into larger fields. Field boundaries are largely mature hedges of ash, oak, holly and hawthorn, with scattered trees and with some drystone walling near farm entrances and drystone wall defining the extent of the moorland above some of the farms, as at Tyddyn Norbury. There is a similar drystone mountain wall behind Bryn-bedw and the upper ends of some of the strip fields behind Star Farm also have drystone boundaries. There is some variation in the field pattern in the vicinity of the moorland edge farms on the eastern side of the character area where there are a number of smaller fields set out around the farmhouses or others are set out along the contour. 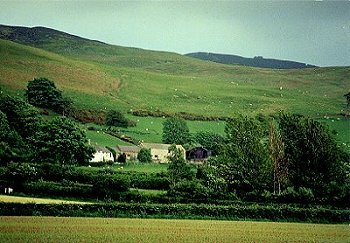 Lynchets have occasionally been formed on some of the sloping ground. The date of the pattern of strip fields has not yet been established: similar medieval field patterns are known in areas of East Anglia, the relationship here with the half-timbered house at Esgairlygain suggesting that it may be of at least late 16th- or early 17th-century date, and possibly either representing a distinctive form of enclosed open field or enclosed common land. A smaller area of similar strip fields can also be seen to the east of Ffordd-las in the Llandyrnog character area to the north. Roads and farm tracks, which characteristically have formed hollow-ways, tend to run parallel with or at right-angles to the field pattern. Small area of mature parkland around Plâs Draw.